Do you need a Galaxy Note 4 case (cover)? More than 80% smartphone owners use cases for their phones. The main purpose of Galaxy Note 4 case is to protect your Galaxy Note 4 from scratches or even drops. Of course, some owners may expect the Galaxy Note 4 case to make the phone look better. But Galaxy Note 4 case, juts like other phone cases, will add some weight to the phone. Even some ultra-slim cases may add about 10 grams. Normally, Galaxy Note 4 case will increase the weight at least 5% of the phone weight. It is up to you to decide whether you get a case for your Galaxy Note 4. Are you considering to get a Galaxy Note 4 case or not. Here are the top 3 reasons why you should get one. 1. Galaxy Note 4 is NOT water and dust resistant due to the presence of S Pen. Galaxy S5 is water and dust resistant, so many Galaxy Note 4 owners “assume” Galaxy Note 4 is also water and dust resistant. This is not true. Because of the S Pen detection feature (when you take out the S Pen, Galaxy Note 4 should knows it), Galaxy Note 4 is not water and dust resistant. Actually, all Note devices are not water and dust resistant. Some hybrid Galaxy Note 4 cases can provide substantial protection from drop or impact. If you dropped your smartphone more then 3 times in last 12 months, you definitely should get a protective case. Just like other smartphones, Galaxy Note 4 may get a broken screen (Gorilla glass in your Galaxy Note 4 may not help in a drop accident) or a dead phone when you drop the phone on a hard surface. The small investment in a protective case in this scenario will surely gives you a good ROI. Not all owners like the look of Galaxy Note 4, e.g., the black or white faux leather back of Galaxy Note 4. Samsung doesn’t provide customization for any of their phones. So, there is no chance for your to use services like MotoMaker for Moto X to get the desired exterior for your Galaxy Note 4. The only option is to get a case you like. Galaxy Note 4 case is not for all Note 4 owners. Some may choose not to have one. Here are the top 3 reasons why you may not get a case for your Galaxy Note 4. Galaxy Note 4 is not light. the 176g Galaxy Note 4 is in the heavy and bulk side of today’s smartphones. So, you may have to consider whether it is already too heavy for you. Most cases have a weight of more the 10g. Some hybrid cases can weigh up to 200g. Not all cases are made equal. The poor-quality Galaxy Note 4 case may not provide any protection. In the worst scenario, such cases may magnify the damage to Galaxy Note 4 when you drop the phone. Some may cause scratches on the phone, instead of protect the phone from scratches. So, it is important to get a good quality Galaxy Note 4 case. Compared to the phone, the Galaxy Note 4 case usually costs less than 5% of Galaxy Note 4. But for some owners, the phone is subsidized by the carrier. The $30 price tag may mean 10% to 30% of the phone price. The good thing is that you can get a decent Galaxy Note 4 case at an affordable price if you know how to get such cases. This guide is here to serve this purpose: how to get a high quality and affordable Galaxy Note 4 case. Right means the Galaxy Note 4 case 1). can meet all your requirements; and 2) is within your budget. Here are the secrets of getting a right Galaxy Note 4 case. Understand the levels of protections you need. If you drop your smartphone quite often, you probably need a dual-layer hybrid Galaxy Note 4 case with decent impact protection, e.g., OtterBox case. Usually higher level protection need bulkier case or cover. So bear this in mind: more protection usually means heavier. Know your preference. There are so many different types of Galaxy Note 4 cases in the market. You need know your preference: 1). the format/style, e.g., back cover, flip cover, wallet; 2). the design, e.g., the color, the art; 3). the material, e,g, genuine leather, plastic, metal, soft material; and 4). the weight (how heavy you can handle). Don’t over-spend for your Galaxy Note 4 case. You should plan the budget for your Galaxy Note 4 cover before buying one. Don’t over-spend. You can always get an affordable one for your Galaxy Note 4. Here are some recommended Galaxy Note 4 cases. [easyazon_block add_to_cart=”default” align=”left” asin=”B00MAWQPJQ” cloaking=”default” layout=”top” localization=”yes” locale=”US” nofollow=”default” new_window=”default” tag=”net7749-20″]Spigen has built its reputation as one of the most recognized phone accessories companies. It usually offers the premium quality accessories at affordable price. In other words, you can maximize the value of your money, although their products are seldom the cheapest. Spigen Slim Armor Case for Galaxy Note 4 is a hybrid dual-layer Galaxy Note 4 case. TPU and Polycarbonate layers provide decent protections from shock and impact. 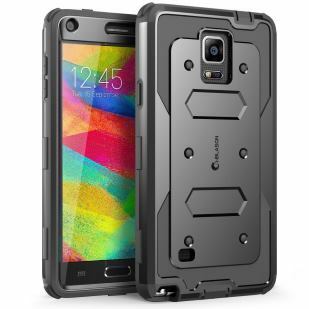 This case is an alternative for OtterBox’s Commuter series case for Galaxy Note 4. This case comes with a quite unique kickstand. As a dual-layer case, this case is not light. It weighs about 163g (5.76 ounces). If you tend to drop your phones, you probably can consider this case for your Galaxy Note 4. [easyazon_block add_to_cart=”default” align=”left” asin=”B00O88TRYU” cloaking=”default” layout=”top” localization=”yes” locale=”US” nofollow=”default” new_window=”default” tag=”net7749-20″]If you prefer a wallet case for your Galaxy note 4, this case provides best value. At this price ($12.99), you cannot expect genuine leather. The case is made of PU leather with reasonable quality. There are several slots for your cards and cash in this case. If you often take public transportation, it can be convenient to tap the phone and pass through the gate. Please note, most automatic payment in public transportation systems is using NFC. You may have to disable NFC in your Galaxy Note 4 to use your NFC enabled payment card in the case. This case also offer back-stand function so that you can enjoy the contents on your Note 4 when it is standing on the table. This is not very common in wallet cases. Another small, but useful feature of this case is the detachable strap. Do you have questions on choosing a Galaxy Note 4 case? Please let us know your questions on Galaxy Note 4 case in the comment box below. We will try to help you!. Since I have bad arthritis in both hands, I find using the buttons on my Note 4 very difficult when using a case. They are just difficult to press. I’m looking for a case that has cut-outs so that I can press the buttons themselves rather than something covering the button. Either that, or a case where there is virtually no resistance in the material that covers the buttons. Most Samsung cases do not cover the buttons. Actually, with S View cover or other similar wallet-like cases, it is not necessary the press the buttons. You can turn on the screen by lifting the front cover. Especially for users of fitness apps I would note, that a typical hybrid case (like the SPIGEN case) avoid the perfect functionality of the pulse sensor. SPIGEN gives some hints, how to use the sensor with the case but in 95% of my attempts the sensor fails. Without that case 95% of my attempts to measure the pulse are successful. I would also note, that a case like the SPIGEN hybrid cases increases the overall measurement in all dimensions. The Note 4 without a case is very handy, relatively thin and I really like the look and the haptics. I was surprised about the great impact for measurement and haptics as I used the SPIGEN Neo Hybrid Metal case. If you have smaller hands (like me) keep that in mind. I would, despite of all the disadvantages, recommend to use a case. The Note 4 is one of the most expensive phones on the market and worth to protect. Love this guide for Samsung Galaxy phone cases, was wondering though what about more personalised phone cases? I’ve seen some amazing 3D printed cases that you can create on a home 3D printer but wonder about the quality of them.